I like to make plans. Everyone knows that. Friends make fun of my enthusiasm and Sean moans about my lists of things to do, but at the end of the day everybody loves it when the plans actually come around and we are doing something new and exciting. Each Tuesday, I pick up TimeOut and stock up on options for the week. I receive emails from multiple sources of new restaurants opening up, “hot” events that cannot be missed, and favorite lesser known places to try out. With so many options coming from all of these sources, I end up with so much that I want to do that none of it actually gets done (seriously, I literally read an email and want to do it all!). In order to focus my attentions on stuff I can actually accomplish, I have decided to create a monthly bucket list. It will be a list of ten things I want to do – some new experiences and some oldies that I want to bring back. I’m kicking it off this month with all of the things I want to do before it is too cold to function in London. Finish the living room so it is finally a pleasant living space for us and for visitors! I’ll be sure to update everyone on my progress at the end of the month. Of course, now I just need to get out of bed and get cracking! I love making plans too. Half the fun is in the planning, I reckon. Sometimes, most of the fun. Maybe I should try monthly bucket lists. 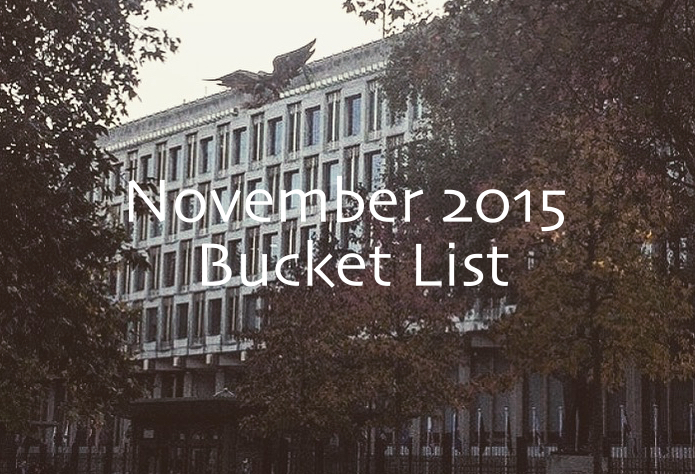 Pingback: Recap: November 2015 Bucket List | Kelly, Unwrapped!